SpyWarn - Spyware DetectionPhone bugged? - Check it! An AlphaDigits Top Rated App! SpyWarn™ comes with a FREE eBook version of, "Is My Cell Phone Bugged?" The hardcover version is rated 4.5 stars out of 5 on Amazon, and sells for over 5 times the cost of this app. Each of your SpyWarn™ tests is stored privately on your phone, nowhere else. This makes recognizing anomalies easy. You get to see the data as it is being collected. Techies appreciate this, and it is entertaining for the average person. Consult with a licensed, professional Technical Surveillance Countermeasures (TSCM) specialist. Answer 20 question about your phone's behavior. Conduct the automatic ANALYSIS. Set the duration timer. Press begin. Your phone works overtime when it is infected with spyware. SpyWarn™ sees this. When the SURVEY and ANALYSIS results are in, SpyWarn's algorithm computes your THREAT LEVEL. If you feel you have a problem click the information icon for directions. 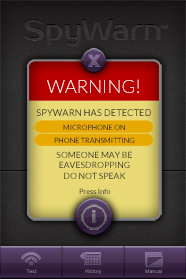 SpyWarn™ detects real-time eavesdropping while it open. If the microphone is on, the phone is transmitting, and you are not making a call, you have a problem. Either spyware is at work on your phone, or your phone had been taken over by baseband bandits (no spyware needed). "Interesting & Fun To Say The Least - This App does exactly what it says." ~ Matt F.
"Pretty good! Set timer and leave for a period and it monitors all connectivity. Seems a pretty good idea!" ~ Andrew T.
"This app is not the usually suspect compared to others. Essentially an info tool which is a good addition. The manual/book is worth the dosh alone..." ~ P.G. NOTE: SpyWarn™ is a standalone test. Use only when phone is not being used for other activities (calls, email, etc.). Turn off all other apps before testing. Turn off SpyWarn™ for normal phone use. Twenty subjective questions ask about your phone’s symptoms. Upon completion, a preliminary THREAT LEVEL is computed. Results are interpreted as LOW (0-33%), MEDIUM (34-66%), or HIGH (67-100%). These tests objectively measure activity within your phone, while it is not in use. SURVEY and ANALYSIS results are combined to produce a final THREAT LEVEL. 3. The eBook “Is My Cell Phone Bugged?” is embedded in the SpyWarn™ app. 3. You will see the Instructions page. 4. Either flick the screen to the left to see the first page, or press the top right button for the Table of Contents. Welcome to SpyWarn™, a forensic investigation anyone can conduct to evaluate the likelihood a smartphone is infected with illegal surveillance spyware. • Make the phone dial someone. • Access smartphone voice mails. • Send texts using a fake number. • Track using the phone’s GPS capabilities. • Receive a text revealing the length of calls. • Receive a text alert whenever the phone is in use. • Eavesdrop by remotely activating the microphone. • Obtain a log of the phone numbers called, and who called in. This app is not designed to detect simple adware spying by marketers. Top left. Shows the most current THREAT LEVEL evaluation. 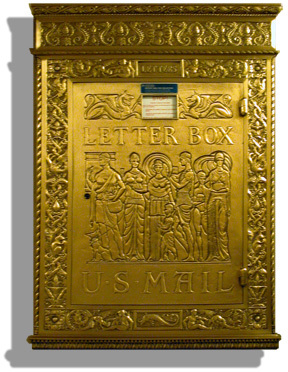 Top right. Press the icon for additional information about that page. This combination of subjective observations and quantifiable technical data produces the most accurate indication of your phone being infected with spyware. Making a determination that your phone is bugged with spyware is initially a matter of observation. Murray Associates has identified the top 20 warning clues that spyware is present on a mobile phone. All of these clues are fairly easy to observe. Keep in mind that some clues may also reflect issues other than spyware—your battery dying prematurely simply because it has reached the end of its life span, for example. However, the more warning clues you notice, the more likely your phone is infected. Answer the questions as well as you can. You may pause whenever you want, and you can change your answers during the test. Once all questions are answered to your satisfaction, press the COMPUTE button. A preliminary THREAT LEVEL (0-100%) will appear. The likelihood of your phone being infected with spyware is generally interpreted as LOW (0-33%), MEDIUM (34-66%), or HIGH (67-100%). The latest computation is stored on the METER. Data being analyzed during this test includes: the amount of time the phone is transmitting; and the amount of data being sent and received. The battery is also being monitored during the ANALYSIS. Unusually sharp battery charge drops when the phone is not otherwise being used is another clue spyware is at work behind the scenes. The ANALYSIS may be conducted in different increments of time. The longer the test is run, the better the chances are you will detect spyware at work, and real-time eavesdropping. The results of the ANALYSIS are also reported as a THREAT LEVEL percentage. This result is averaged in with the SURVEY THREAT LEVEL, thus providing the most accurate indication of spyware having infected your phone. This file stores the results for future reference and comparison. These records may be accessed at any time. Conduct ANALYSIS on a regular basis when your phone is spyware free. This creates a profile of your phone under normal operating conditions. Should a spyware Trojan infect your phone later, the latest ANALYSIS will be an anomaly by comparison. A special edition of “Is My Cell Phone Bugged? Everything you need to know to keep your mobile communications private.” is included as part of SpyWarn™. This book was first published as a hardcover edition, by Emerald Book Company (ISBN-13: 97819345728870) for $17.95. It received excellent reviews from some of the most respected names in the security field, and has a 4.3-star review rating on Amazon. It is an invaluable resource. In addition to determining how to tell if a phone is bugged, the book discusses many other communications privacy threats. It also provides practical advice and checklists for really solving snooping issues and other personal privacy issues. Is My Cell Phone Bugged? was written by Kevin D. Murray, CPP, CISM, CFE – an independent and certified professional security consultant with over three decades of corporate counterespionage experience. The REAL-TIME EAVESDROPPING ALERT is a pop-up window which may appear during the ANALYSIS test. When displayed, it means your phone is transmitting and the microphone is turned on. This is the most positive evidence there is indicating spyware is has infected your phone. Someone is listening, now. If seen, do not say anything which would alert the listener that you know they can hear you. Press the alert button and follow the recommendations provided on the screen.